On Wednesday afternoon, political assembly of the European People's Party had debated the initiative of its thirteen member parties to expel Fidesz, and ended up adopting the proposal of the EPP Presidency that suggested the suspension of Fidesz's membership and setting up a special committee to monitor how Fidesz complies with the fundamental values of the EPP with 190 delegates voting for the proposal and only 3 against. Earlier on Wednesday, Hungarian Chief of Staff Gergely Gulyás announced that a decision to suspend Fidesz's membership would prompt the party to immediately resign from the European People's Party, however, the EPP's adopted proposal states that the EPP and Fidesz jointly agree that Fidesz suspends its membership. On Wednesday, the EPP's political assembly decided not to expel Fidesz, but rather adopted the proposal that suspended the membership rights of Fidesz until further notice, and placed the party under the surveillance of an "Evaluation Committee" comprised of the former president of the European Council, Belgian Herman Van Rompuy, Austrian Wolfgang Schüssel, and German Hans-Gert Pöttering. Freedom of expression, of science and education are fundamental to us. Therefore, the pending legal issues regarding the Central European University must be clarified." Esther de Lange, a presidency member of the EPP, told journalists before the meeting that this committee is necessary to avoid what repeatedly happened before - Fidesz making promises but failing to keep them. Fidesz's suspension means that the party is immediately stripped of its voting rights in EPP bodies, cannot suggest candidates for EPP positions, and they are barred from participating in EPP meetings, with the next one being tomorrow, where EPP's heads of governments will meet to coordinate their positions at the upcoming EU leaders' summit. The decision adopted by the Political Assembly does not determine the length of this suspension, it merely states that the committee will present its report to the Presidency in "due course". As we have reported earlier, thirteen members of the EPP had requested the expulsion of Fidesz from the political group after the Hungarian government started its propaganda campaign featuring Jean-Claude Juncker, the European Commission's EPP-nominated president. Tensions around Fidesz had been mounting now in the European People's Party for years as Fidesz overstepped one red line EPP leaders warned about after the other, and Manfred Weber, the group's lead candidate made one last effort to smooth the situation over by presenting Orbán with three conditions (no more anti-EU propaganda, apology to EPP members, and CEU's continued Budapest operation). Weber said compliance with these conditions would prove Fidesz's willingness to respect the fundamental values of the EPP, therefore the party would not be expelled. "THIS IS ABOUT THE DIGNITY OF FIDESZ AND THE COUNTRY." After the vote, a relieved Manfred Weber said that now he's passing on the case of Fidesz to Herman van Rompuy. Weber emphasised that the EPP has made a clear decision and that Fidesz will not have a say in the future of the EPP. He also said that he would not call Orbán's actions in the last few days proof of Fidesz's willingness to respect EPP's values in the future, but they gave Weber hope. the current dispute within the EPP is a gift to the socialists of the European Parliament. 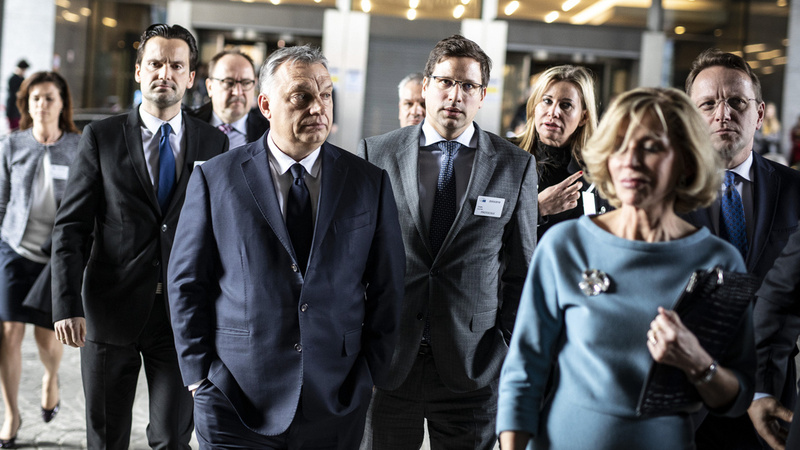 He said that throughout the meeting, he repeatedly asked the thirteen members who requested the expulsion of Fidesz to revoke their initiative, but they did not, which is what necessitated the three-hour-long debate, where there were no substantial questions, merely questions of power. Fidesz unilaterally requested the suspension of its membership rights. IT'S NOT IMPORTANT WHEN THE EVALUATION COMMITTEE SUBMITS ITS REPORT, BUT IT'S IN EVERYONE'S INTEREST THAT IT ONLY HAPPENS AFTER THE EUROPEAN ELECTIONS. THERE WAS NO CAMPAIGN AGAINST JEAN-CLAUDE JUNCKER. Responding to journalists' questions, he added that the government campaign was just an information campaign to keep Hungarians up-to-date with EU events, and Fidesz had no campaign whatsoever, as it is prohibited by law for a party to campaign before the start of the official election campaign - although it's worth noting that while that is true, even the OSCE report on the 2018 Hungarian general elections mentioned how similar government campaigns were practically indistinguishable from Fidesz's own campaign then, and how they negatively affected the level playing field in the leadup to the elections. As for what's next, Orbán promised to focus all of their energies on their campaign for the EPP.